I wrote a serious ebook about Will Rogers, but his quotes have an eye twinkle behind them. 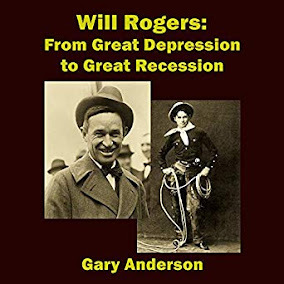 The book is Will Rogers from Great Depression to Great Recession. Will Rogers spooks folks like Jamie Dimon, who wants to keep people just solvent enough to need a loan. You can see that Rogers didn't like that burden put upon the working man. We still have too much stuff, just like we had in Rogers' day. And it was all bought on credit, which has put many of us in the poor house. You don't think Dimon and the rest of the big banksters want everyone to know about Will Rogers. 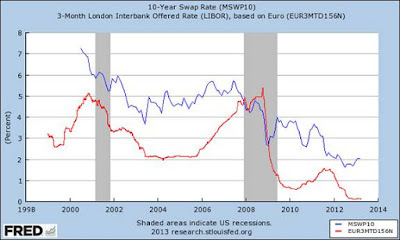 If they did, they might think twice about borrowing, and the bankers would have to get real jobs. Rogers haunts Lloyd Blankfein so much that he almost choked on a piece of meat right after he said he was doing God's work, enabling debt and speculation far and wide. Now, I don't begrudge a company from getting prudent debt to expand operations. That company has to have restraint. I doubt if Rogers would have objected. He was teaching and warning the consumer, the working man, the family man, that borrowing with a dollar down, with easy money, was not such a good idea. I often wonder what it would have looked like if Will Rogers had roped Lloyd Blankfein and tied him up like a hog. I can picture it now. Don't try it or the government will throw you in jail for a hundred years. Goldman Sachs is very evil, IMO, and Lloyd is the captain of that ship of darkness. I appreciate the political satire of Will Rogers. He was a great man and was beloved and the bankers (sters) were hated. And they are once again as they have tried to pull the same bad shenanigans and more than back in Rogers' day. They were almost well behaved for 60 plus years. But it all became undone with the housing bubble of the last decade. I don't say this often, but when I do, be frugal my friends. Toast one to the memory of Will Rogers when you are thirsty. I prefer Dos Equis! As of the writing of this article, the official site for the Will Rogers Museum is WillRogers.com. I do not believe in hauntings, just FYI. I do believe that what goes around could come around and in the Golden Rule.